The Clerk’s Office is seeing an increase in eFilings that don’t conform to the eFiling Guidelines posted online. Non-conforming documents can be rejected, resulting in missed filing deadlines. The most common error is attempting to file documents that are over the 10MB size limitation. As technology has improved, full-color documents and images and the clarity resolution that is available have resulted in much larger file sizes. Very large files cannot be easily opened and reviewed. From the practitioner’s standpoint, although a large file may make it through the eFiling system, the judicial officer receiving the document may have to wait much longer than usual for the document to open before they can review and take action on the filing. Reducing large files will help the speed of filing and review throughout the process. You can learn tips for reducing the size of files by doing an internet search with key words and phrases like “shrink pdf,” “reduce file size,” “make file smaller,” and similar terms. 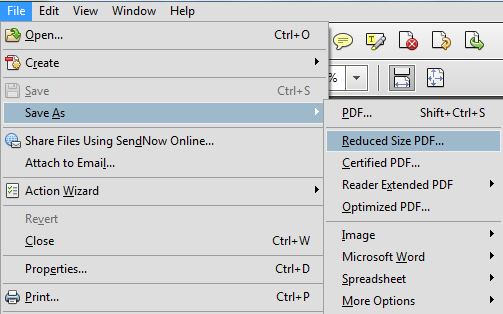 Newer versions of Adobe Acrobat’s PDF-making software have an option under the “Save As” function called “Reduced Size PDF” that may help. See the image following this article for that feature. Another error is password-protected documents that are filed without first removing the password protection. The Clerk’s Office is unable to open a document for review if a password is required to unlock the document. These documents are rejected with a note from the review clerk to remove the password protection and resubmit. Documents that contain hyperlinks, bookmarks, and other navigational aids to external networks such as cited court cases, court rules, laws, and codes are allowed but may not function. Filers are advised that links within documents and the content they link to are not considered part of the official record. Links within documents may be disabled as part of the eFiling process and the conversion from native format to PDF. The Guidelines direct that hyperlinks contain a text reference to the target of the link to help offset this issue. To review the eFiling Guidelines that apply to all eFiling in the Superior Court in Maricopa County, visit the Clerk’s website at https://efiling.clerkofcourt.maricopa.gov/efilingguidelines/.